lagane. They were first recorded in Italy between 65 BC-8 BC as a frugal supper with chickpeas and leaks. 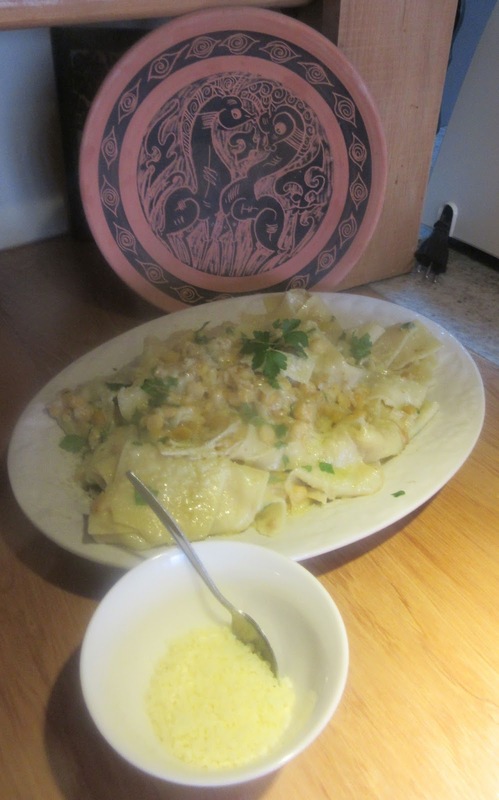 It is thought to be the forerunner of lasagna, tagliate and/or fettuccine. 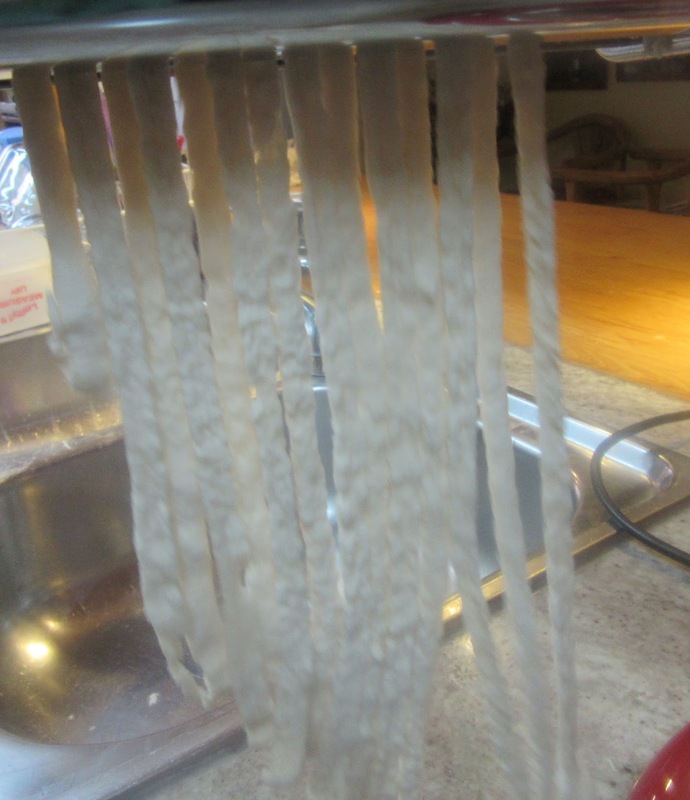 They are thin strips of pasta originally made with semolina, spelt or farina and water. The ancient shape is unknown. They could have been in the shape of a pancake or a flat cake. It has been documented that Etruscans did not boil them. Perhaps they were covered and cooked over coals or fried. Authors like Grainger and Kelly claim Apicius provides layered recipes consisting of alternating meat or fish with "oil cake" which they seem to translate as lagane. They claim that he does not give a recipe for lagane, which leads one to believe that this was common fare. The North Africans are believed to have brought it to Al-Andalus between the 11th-13th C. Its existence in Granada is confirmed in manuscripts found in the Alhambra. The Muslims in Al-Andalus were the first to record boiling them. After boiling in fatty broth, they can be seasoned with cheese, saffron, pepper and cinnamon. It is very soft pasta good for people in the Middle Ages who had teeth problems. Modern lagane, in central and southern, Italy is like wide tagliatella. They are made with durum wheat or fine wheat flour, water and salt. 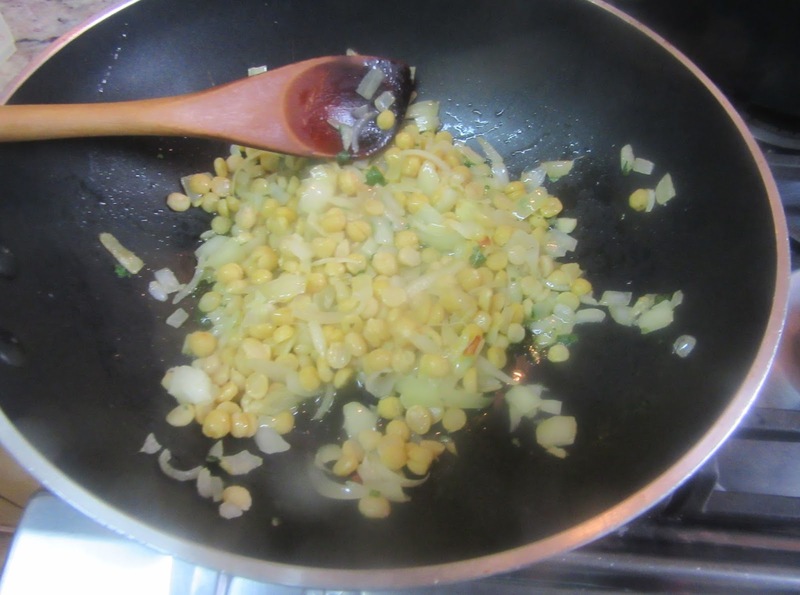 It was and continues to be a very popular dish accompanied by chickpeas in southern Italy in particular. It is a versatile dish appropriate for vegetarians as no eggs are used to make the pasta and cheese is optional. Although not common, meat or shellfish can be welcome additions. Wash chickpeas and soak them in water overnight. The following day, strain the chickpeas and rinse them. Put them in a large pot. Cover with plenty of water. Add the bay leaf and bring to a boil. Reduce heat and gently boil until tender. The time depends on the age of the chickpea. One and a half hours is average cooking time. When tender add 1 tbsp olive oil and salt to taste. Remove from heat and strain, reserving the broth. Chop the onion and sautée it for a few minutes. Add garlic sliced. When the onion is translucent add the rosemary and half the chickpeas and sautée until toasted. Add wine and parsley leaves chopped. Mix the salt and the water. Add the flour. Roll it into a ball. Lightly flour a smooth surface. Knead the pasta for about 10 minutes until smooth. Roll it into a ball and cover it with a cloth or plastic. Place it in a dark spot and leave it for ½ hour. Divide the dough into 4 parts. If a pasta machine is available, run the dough through the fettuccine setting several times on the thick setting. 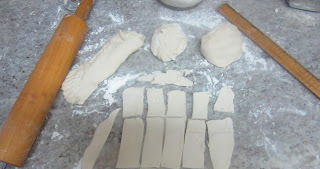 If a pasta machine is not available, roll each portion out on a floured surface and cut strips wider than fettuccine and narrower than lasagna and thicker than both. Strips can be between ¼”- 1” wide and 2”-4” in length. Bring the broth from boiling the chickpeas to a brisk boil and add the lagane. Continue to boil for 3-9 minutes, as per the thickness until the pasta is al diente. Strain off the broth, reserving it. Add the ½ c of the broth to the sauce. Add the pasta. Mix well and remove from heat. Grate the cheese if using it and add ¾ of it to the mixture. Reserve the remaining cheese for eaters to sprinkle on the dish when served. Serve piping hot with a small of grated cheese on the side.